The term “implant” means the transplantation of nonliving inert material and the graft means the transplantation of living tissue, and its success depends on the survival of the transplanted cells. Implants include synthetic materials such as ceramic, hydroxyapatite, and Problast which are called alloplastic material, and the implant also includes metals such as. The graft may be autogenic grafts taken from the same individual, isogenic grafts taken from an individual who is genetically similar or related to the recipient or the host, allogeneic graft taken from individual who is not genetically related to the recipient or host, and xenograft taken from a donor of another species, for example, animal bone grafted to men. Autogenous bone grafts to reconstruct and recontour the lost facial bones are the ideal technique; the facial bone loss may be reconstructed and contoured by many types of autogenic bone grafts such as cancellous autograft, iliac crest bone graft, costochondral graft, and autogenous particulate bone graft. A 21-year-old male admitted to the maxillofacial center with left zygomatic bone loss due to a shell injury. Medical history demonstrated no drug allergy and no previous surgery. Clinical examination showed normal vital signs, no altered facial sensation, and no facial paralysis. The new modified Problast used in this new surgical technique being designed for surgical implantation, especially in cosmetic surgery, has a low crushing strength and it may be resorbed by external pressure. The aim of this new surgical technique is to encourage bone ingrowth through the Proplast and replacement of the Proplast by bone that means convert the implant into graft. Painting the Proplast with a mixture of the biocompatible material such as β, Tricalcium phosphate with an oily calcium hydroxide suspended (stimulate osteoconduction, with concentration of the growth factors), together with super porous Hydroxyapatite encourages bone ingrowth through its porosity. This creates a surgical pocket large enough for the Proplast implant to be inserted and gives the required esthetic contour of the zygomatic bone [Figure 2]a, the wound closed in layers without tension to avoid some resorption of the Proplast [Figure 2]b. 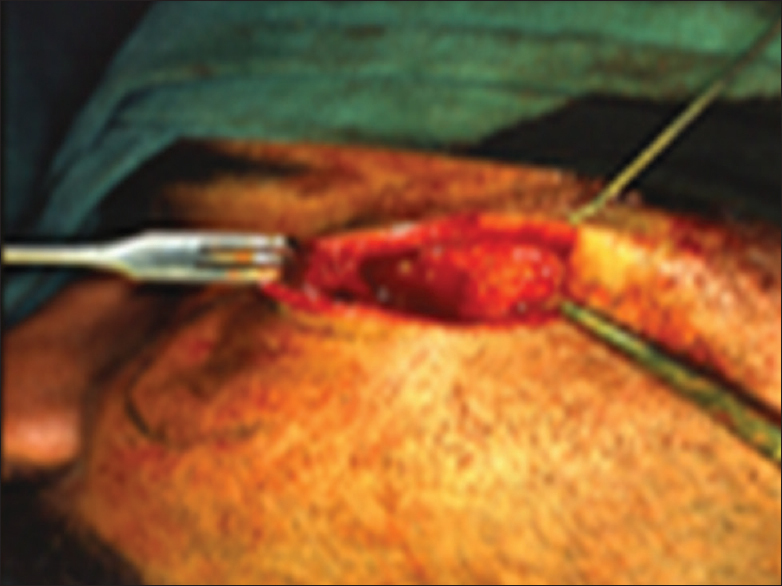 It is a reasonable simple surgical technique and less trauma to the patient. Less time consuming by the surgeon, it needs no fixation of the Problast to the underlying bones. Indicated for patients, how are medically contraindicated to the extensive surgery such as bone graft surgery, osteotomies, or refuse such surgery. All the combinations of the materials used in this technique are biocompatible, not rejected by patient tissue, and give a permanent esthetic result. Few months postoperative, a growth of bone tissue through the implant start and complete replacement of the implant by bone is expected; also, the clinical finding showed a result superior to that achieved by the Proplast alone. It is a new idea; it is an innovation of a new surgical technique in restoring the facial bone loss and deformities. More studies and follow-up are recommended. Moore WR, Graves SE, Bain GI. Synthetic bone graft substitutes. ANZ J Surg 2001;71:354-61. U.S. Patent 3,992,725 and 4,129,470 Corresponding Foreing Patents and Pending Applications. Texas U.S.A: Proplast is Registered Trademark of Vitek, Inc Houston; 1984. Hahn TJ. reconstruction with Chrome, Cobalt Mesh implants. American J Implantol 2008. p. 5-10. Fennis JP, Stoelinga PJ. Bridge the defect filled with an autogenous particulate bone graft in hisotmorphometric study. J Oral Maxillofic 2004;33:48-55. Podaropoulos L, Veis AA, Papadimitriou S, Alexandridis C, Kalyvas D. Bone regeneration using beta-tricalcium phosphate in a calcium sulfate matrix. J Oral Implantol 2009;35:28-36. Shiria Y, Okuda K, Kubota T, Wolff LF, Yoshie H. The comparative effectiveness of granules or blocks of superporous hydroxyapatite for treatment of intrabony periodontal defects. Sci Res 2012;2:81-7. Aparna S, Setty S, Thakur S. Oily calcium hydroxide suspension in the treatment of infrabony periodontal defects: A randomized controlled clinical trial. Quintessence Int 2011;42:835-42. Puzovic D, Konstantinovic VS, Dimitrijevic M. Evaluation of maxillofacial weapon injuries: 15-year experience in Belgrade. J Craniofac Surg 2004;15:543-6. Owens BD, Kragh JF Jr., Wenke JC, Macaitis J, Wade CE, Holcomb JB, et al. Combat wounds in operation Iraqi Freedom and operation enduring freedom. J Trauma 2008;64:295-9.